Pompe disease is an inherited enzyme defect that usually manifests in childhood. The enzymes affected normally catalyze reactions that ultimately convert glycogen compounds to monosaccharides, of which glucose is the predominant component. This results in glycogen accumulation in tissues, especially muscles, and impairs their ability to function normally. Most patients experience muscle symptoms, such as weakness and cramps, although certain glycogen storage diseases manifest as specific syndromes, such as hypoglycemic seizures or cardiomegaly. Unfortunately, no cure exists, although diet therapy and enzyme replacement therapy may be highly effective at reducing clinical manifestations. In some patients, liver transplantation may abolish biochemical abnormalities. A glycogen storage disease (GSD) is the result of an enzyme defect. These enzymes normally catalyze reactions that ultimately convert glycogen compounds to monosaccharides, of which glucose is the predominant component. Enzyme deficiency results in glycogen accumulation in tissues. In many cases, the defect has systemic consequences; however, in some cases, the defect is limited to specific tissues. Most patients experience muscle symptoms, such as weakness and cramps, although certain GSDs manifest as specific syndromes, such as hypoglycemic seizures or cardiomegaly. Although at least 14 unique GSDs are discussed in the literature, the 4 that cause clinically significant muscle weakness are Pompe disease (GSD type II, acid maltase deficiency), Cori disease (GSD type III, debranching enzyme deficiency), McArdle disease (GSD type V, myophosphorylase deficiency), and Tarui disease (GSD type VII, phosphofructokinase deficiency). One form, Von Gierke disease (GSD type Ia, glucose-6-phosphatase deficiency), causes clinically significant end-organ disease with significant morbidity. The remaining GSDs are not benign but are less clinically significant; therefore, the physician should consider the aforementioned GSDs when initially entertaining the diagnosis of a GSD. Interestingly, a GSD type 0 also exists and is due to defective glycogen synthase. 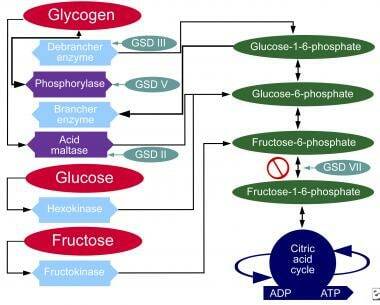 The chart below demonstrates where various forms of GSD affect the metabolic carbohydrate pathways. Glycogen storage disease, type II. Metabolic pathways of carbohydrates. These inherited enzyme defects usually manifest in childhood, although some, such as McArdle disease and Pompe disease, have separate adult-onset forms. In general, GSDs are inherited as autosomal recessive conditions. Several different mutations have been reported for each disorder. Unfortunately, no cure exists, although diet therapy and enzyme replacement therapy may be highly effective at reducing clinical manifestations. In some patients, liver transplantation may abolish biochemical abnormalities. Active research continues. Acid maltase catalyzes the hydrogenation reaction of maltose to glucose. Acid maltase deficiency is a unique glycogenosis in that the glycogen accumulation is lysosomal rather than in the cytoplasm. It also has a unique clinical presentation depending on age at onset, ranging from fatal hypotonia and cardiomegaly in the neonate to muscular dystrophy in adults. With an enzyme defect, carbohydrate metabolic pathways are blocked, and excess glycogen accumulates in affected tissues. Each GSD represents a specific enzyme defect, and each enzyme is either in specific sites or is in most body tissues. In 1999, Bijvoet, Van Hirtum, and Vermey reported glycogen accumulation in murine blood vessel smooth muscle and in the respiratory, urogenital, and gastrointestinal tracts. Glycogen accumulation is mostly within the lysosomes, although cytoplasmic accumulation may occur. Glycogen accumulation within the muscle, peripheral nerves, and the anterior horn cells results in significant weakness. In the infantile form, accumulation may also occur in the liver, which results in hepatomegaly and elevation of hepatic enzymes. Herling and colleagues studied the incidence and frequency of inherited metabolic conditions in British Columbia. GSDs are found in 2.3 children per 100,000 births per year. In southern China and Taiwan, infantile Pompe disease is the most common GSD with a frequency of 1 in 50,000 live births. Data from screening 3000 Dutch newborns with the previously described mutations revealed a calculated frequency of 1 in 40,000 for adult-onset disease. The infantile form usually is fatal, with most deaths occurring within 1 year of birth. Cardiomegaly with progressive obstruction to left ventricular outflow is a major cause of mortality. Weakness of ventilatory muscles increases risk of pneumonia. Later clinical onset usually corresponds with more benign symptoms and disease course. Newer research holds promise for gene therapy (see Prognosis below). The adult form manifests with dystrophy and respiratory muscle weakness. Respiratory insufficiency is a significant morbidity. Glycogen deposition within blood vessels may result in intracranial aneurysm. Significant morbidity or mortality depends on location and clinical nature. Males and females are affected with equal frequency because of autosomal recessive inheritance. In general, GSDs manifest in childhood. Later onset correlates with a less severe form. Some authors make a distinction between infant and childhood disease, although most investigators recognize a disease continuum because of overlap of clinical manifestations. Because both infantile and adult forms of Pompe disease occur, it should be considered if the onset is in infancy. The infantile form manifests with hypotonia hours to weeks after birth, with typical presentation between 4-8 weeks. Between infancy and adulthood, a youth form may manifest. It is less severe in later presentations. The adult form emerges as skeletal and respiratory muscle weakness in patients aged 20-40 years. Lukacs Z, Nieves Cobos P, Mengel E, et al. Diagnostic efficacy of the fluorometric determination of enzyme activity for Pompe disease from dried blood specimens compared with lymphocytes-possibility for newborn screening. J Inherit Metab Dis. 2009 Dec 23. [Medline]. Kishnani PS, Beckemeyer AA, Mendelsohn NJ. The new era of Pompe disease: advances in the detection, understanding of the phenotypic spectrum, pathophysiology, and management. Am J Med Genet C Semin Med Genet. 2012 Feb 15. 160(1):1-7. [Medline]. Herzog A, Hartung R, Reuser AJ, Hermanns P, Runz H, Karabul N, et al. A cross-sectional single-centre study on Pompe disease in 42 German patients: Molecular analysis of the GAA gene, manifestation and genotype-phenotype correlations. Orphanet J Rare Dis. 2012 Jun 7. 7(1):35. [Medline]. Gort L, Coll MJ, Chabas A. Glycogen storage disease type II in Spanish patients: High frequency of c.1076-1G>C mutation. Mol Genet Metab. 2007 Sep-Oct. 92(1-2):183-7. [Medline]. Martiniuk F, Chen A, Mack A. Carrier frequency for glycogen storage disease type II in New York and estimates of affected individuals born with the disease. Am J Med Genet. 1998 Aug 27. 79(1):69-72. [Medline]. Jones HN, Muller CW, Lin M, et al. Oropharyngeal dysphagia in infants and children with infantile Pompe disease. Dysphagia. 2009 Sep 10. [Medline]. Musumeci O, la Marca G, Spada M, et al. LOPED study: looking for an early diagnosis in a late-onset Pompe disease high-risk population. J Neurol Neurosurg Psychiatry. 2016 Jan. 87 (1):5-11. [Medline]. Aminoff MJ. Electromyography in Clinical Practice. New York, NY: Churchill Livingstone; 1998. Jeffrey S. FDA Expands Approval of Pompe Disease Drug. Available at http://www.medscape.com/viewarticle/829330. Accessed: August 9, 2014. Taglia A, Picillo E, D'Ambrosio P, Cecio MR, Viggiano E, Politano L. Genetic counseling in Pompe disease. Acta Myol. 2011 Dec. 30(3):179-81. [Medline]. [Full Text]. Strothotte S, Strigl-Pill N, Grunert B, et al. Enzyme replacement therapy with alglucosidase alfa in 44 patients with late-onset glycogen storage disease type 2: 12-month results of an observational clinical trial. J Neurol. 2010 Jan. 257(1):91-7. [Medline]. Phupong V, Shotelersuk V. Prenatal exclusion of Pompe disease by electron microscopy. Southeast Asian J Trop Med Public Health. 2006 Sep. 37(5):1021-4. [Medline]. Chien YH, Lee NC, Thurberg BL, et al. Pompe disease in infants: improving the prognosis by newborn screening and early treatment. Pediatrics. 2009 Dec. 124(6):e1116-25. [Medline]. Burton BK. Newborn screening for Pompe disease: an update, 2011. Am J Med Genet C Semin Med Genet. 2012 Feb 15. 160(1):8-12. [Medline]. Mah C, Cresawn KO, Fraites TJ Jr, Pacak CA, Lewis MA, Zolotukhin I. Sustained correction of glycogen storage disease type II using adeno-associated virus serotype 1 vectors. Gene Ther. 2005 Sep. 12(18):1405-9. [Medline]. Ambrosino N, Confalonieri M, Crescimanno G, Vianello A, Vitacca M. The role of respiratory management of Pompe disease. Respir Med. 2013 Aug. 107(8):1124-32. [Medline]. Angelini C, Nascimbeni AC, Semplicini C. Therapeutic advances in the management of Pompe disease and other metabolic myopathies. Ther Adv Neurol Disord. 2013 Sep. 6(5):311-21. [Medline]. [Full Text]. Banugaria SG, Patel TT, Mackey J, Das S, Amalfitano A, Rosenberg AS, et al. Persistence of high sustained antibodies to enzyme replacement therapy despite extensive immunomodulatory therapy in an infant with Pompe disease: need for agents to target antibody-secreting plasma cells. Mol Genet Metab. 2012 Apr. 105(4):677-80. [Medline]. [Full Text]. Barbullushi M, Idrizi A, Bolleku E, Laku A, Pilaca A. Pompe disease with heterogeneous presentations within a family. Med Arch. 2013. 67(4):297-8. [Medline]. Beck M. Alglucosidase alfa: Long term use in the treatment of patients with Pompe disease. Ther Clin Risk Manag. 2009. 5:767-72. [Medline]. [Full Text]. Bhengu L, Davidson A, du Toit P, Els C, Gerntholtz T, Govendrageloo K, et al. Diagnosis and management of Pompe disease. S Afr Med J. 2014 Apr. 104(4):273-4. [Medline]. Bijvoet AG, Van Hirtum H, Kroos MA. Human acid alpha-glucosidase from rabbit milk has therapeutic effect in mice with glycogen storage disease type II. Hum Mol Genet. 1999 Nov. 8(12):2145-53. [Medline]. Byrne BJ, Falk DJ, Pacak CA, Nayak S, Herzog RW, Elder ME, et al. Pompe disease gene therapy. Hum Mol Genet. 2011 Apr 15. 20:R61-8. [Medline]. [Full Text]. Chien YH, Hwu WL, Lee NC. Pompe disease: early diagnosis and early treatment make a difference. Pediatr Neonatol. 2013 Aug. 54(4):219-27. [Medline]. Cupler EJ, Berger KI, Leshner RT, Wolfe GI, Han JJ, Barohn RJ, et al. Consensus treatment recommendations for late-onset Pompe disease. Muscle Nerve. 2012 Mar. 45(3):319-33. [Medline]. [Full Text]. Dasouki M, Jawdat O, Almadhoun O, Pasnoor M, McVey AL, Abuzinadah A, et al. Pompe disease: literature review and case series. Neurol Clin. 2014 Aug. 32(3):751-76, ix. [Medline]. Elder ME, Nayak S, Collins SW, Lawson LA, Kelley JS, Herzog RW, et al. B-Cell depletion and immunomodulation before initiation of enzyme replacement therapy blocks the immune response to acid alpha-glucosidase in infantile-onset Pompe disease. J Pediatr. 2013 Sep. 163(3):847-54.e1. [Medline]. [Full Text]. Finsterer J. Dilative arteriopathy in metabolic myopathies, particularly Pompe's disease. Acta Neurol Belg. 2012 Mar. 112(1):15-8. [Medline]. Gaeta M, Barca E, Ruggeri P, Minutoli F, Rodolico C, Mazziotti S, et al. Late-onset Pompe disease (LOPD): correlations between respiratory muscles CT and MRI features and pulmonary function. Mol Genet Metab. 2013 Nov. 110(3):290-6. [Medline]. Gungor D, de Vries JM, Brusse E, Kruijshaar ME, Hop WC, Murawska M, et al. Enzyme replacement therapy and fatigue in adults with Pompe disease. Mol Genet Metab. 2013 Jun. 109(2):174-8. [Medline]. Hirshhorn R, Reuser A. Glycogen Storage Disease Type II: Acid alpha-Glucosidase (Acid Maltase) Deficiency. The Metabolic and Molecular Bases of Inherited Disease. New York, NY: McGraw-Hill; 2001. 3389-3420. Hobson-Webb LD, Jones HN, Kishnani PS. Oropharyngeal dysphagia may occur in late-onset Pompe disease, implicating bulbar muscle involvement. Neuromuscul Disord. 2013 Apr. 23(4):319-23. [Medline]. Hobson-Webb LD, Proia AD, Thurberg BL, Banugaria S, Prater SN, Kishnani PS. Autopsy findings in late-onset Pompe disease: a case report and systematic review of the literature. Mol Genet Metab. 2012 Aug. 106(4):462-9. [Medline]. Hundsberger T, Rohrbach M, Kern L, Rösler KM. Swiss national guideline for reimbursement of enzyme replacement therapy in late-onset Pompe disease. J Neurol. 2013 Sep. 260(9):2279-85. [Medline]. Hundsberger T, Rosler KM, Findling O. Cessation and resuming of alglucosidase alfa in Pompe disease: a retrospective analysis. J Neurol. 2014 Sep. 261(9):1684-90. [Medline]. Kanters TA, Hagemans ML, van der Beek NA, Rutten FF, van der Ploeg AT, Hakkaart L. Burden of illness of Pompe disease in patients only receiving supportive care. J Inherit Metab Dis. 2011 Oct. 34(5):1045-52. [Medline]. [Full Text]. Kanters TA, Hoogenboom-Plug I, Rutten-Van Mölken MP, Redekop WK, van der Ploeg AT, Hakkaart L. Cost-effectiveness of enzyme replacement therapy with alglucosidase alfa in classic-infantile patients with Pompe disease. Orphanet J Rare Dis. 2014 May 16. 9:75. [Medline]. [Full Text]. Kishnani PS, Amartino HM, Lindberg C, Miller TM, Wilson A, Keutzer J. Methods of diagnosis of patients with Pompe disease: Data from the Pompe Registry. Mol Genet Metab. 2014 Sep-Oct. 113(1-2):84-91. [Medline]. Kishnani PS, Amartino HM, Lindberg C, Miller TM, Wilson A, Keutzer J. Timing of diagnosis of patients with Pompe disease: data from the Pompe registry. Am J Med Genet A. 2013 Oct. 161A(10):2431-43. [Medline]. Kishnani PS, Beckemeyer AA, Mendelsohn NJ. The new era of Pompe disease: advances in the detection, understanding of the phenotypic spectrum, pathophysiology, and management. Am J Med Genet C Semin Med Genet. 2012 Feb 15. 160C(1):1-7. [Medline]. Kroos M, Hoogeveen-Westerveld M, Michelakakis H, Pomponio R, Van der Ploeg A, Halley D, et al. Update of the pompe disease mutation database with 60 novel GAA sequence variants and additional studies on the functional effect of 34 previously reported variants. Hum Mutat. 2012 Aug. 33(8):1161-5. [Medline]. Kroos M, Hoogeveen-Westerveld M, van der Ploeg A, Reuser AJ. The genotype-phenotype correlation in Pompe disease. Am J Med Genet C Semin Med Genet. 2012 Feb 15. 160C(1):59-68. [Medline]. Lacana E, Yao LP, Pariser AR, Rosenberg AS. The role of immune tolerance induction in restoration of the efficacy of ERT in Pompe disease. Am J Med Genet C Semin Med Genet. 2012 Feb 15. 160C(1):30-9. [Medline]. Lachmann R, Schoser B. The clinical relevance of outcomes used in late-onset Pompe disease: can we do better?. Orphanet J Rare Dis. 2013 Oct 12. 8:160. [Medline]. [Full Text]. Laforet P, Laloui K, Granger B, Hamroun D, Taouagh N, Hogrel JY, et al. The French Pompe registry. Baseline characteristics of a cohort of 126 patients with adult Pompe disease. Rev Neurol (Paris). 2013 Aug-Sep. 169(8-9):595-602. [Medline]. Maggi L, Salerno F, Bragato C, Saredi S, Blasevich F, Maccagnano E, et al. Familial adult-onset Pompe disease associated with unusual clinical and histological features. Acta Myol. 2013 Oct. 32(2):85-90. [Medline]. [Full Text]. Melvin JJ. Pompe's disease. Arch Neurol. 2000 Jan. 57(1):134-5. [Medline]. Messinger YH, Mendelsohn NJ, Rhead W, Dimmock D, Hershkovitz E, Champion M, et al. Successful immune tolerance induction to enzyme replacement therapy in CRIM-negative infantile Pompe disease. Genet Med. 2012 Jan. 14(1):135-42. [Medline]. [Full Text]. Murphy SM, Puwanant A, Griggs RC. Unintended effects of orphan product designation for rare neurological diseases. Ann Neurol. 2012 Oct. 72(4):481-90. [Medline]. [Full Text]. Palermo AT, Palmer RE, So KS, Oba-Shinjo SM, Zhang M, Richards B, et al. Transcriptional response to GAA deficiency (Pompe disease) in infantile-onset patients. Mol Genet Metab. 2012 Jul. 106(3):287-300. [Medline]. Palmio J, Auranen M, Kiuru-Enari S, Löfberg M, Bodamer O, Udd B. Screening for late-onset Pompe disease in Finland. Neuromuscul Disord. 2014 Jun 28. [Medline]. Patel TT, Banugaria SG, Case LE, Wenninger S, Schoser B, Kishnani PS. The impact of antibodies in late-onset Pompe disease: a case series and literature review. Mol Genet Metab. 2012 Jul. 106(3):301-9. [Medline]. Prater SN, Patel TT, Buckley AF, Mandel H, Vlodavski E, Banugaria SG, et al. Skeletal muscle pathology of infantile Pompe disease during long-term enzyme replacement therapy. Orphanet J Rare Dis. 2013 Jun 20. 8:90. [Medline]. [Full Text]. Preisler N, Lukacs Z, Vinge L, Madsen KL, Husu E, Hansen RS. Late-onset Pompe disease is prevalent in unclassified limb-girdle muscular dystrophies. Mol Genet Metab. 2013 Nov. 110(3):287-9. [Medline]. Preisler N, Lukacs Z, Vinge L, Madsen KL, Husu E, Hansen RS, et al. Late-onset Pompe disease is prevalent in unclassified limb-girdle muscular dystrophies. Mol Genet Metab. 2013 Nov. 110(3):287-9. [Medline]. Sahin M, du Plessis AJ. Hydrocephalus associated with glycogen storage disease type II (Pompe's disease). Pediatr Neurol. 1999 Sep. 21(3):674-6. [Medline]. Schuller A, Wenninger S, Strigl-Pill N, Schoser B. Toward deconstructing the phenotype of late-onset Pompe disease. Am J Med Genet C Semin Med Genet. 2012 Feb 15. 160C(1):80-8. [Medline]. Smith BK, Collins SW, Conlon TJ, Mah CS, Lawson LA, Martin AD, et al. Phase I/II trial of adeno-associated virus-mediated alpha-glucosidase gene therapy to the diaphragm for chronic respiratory failure in Pompe disease: initial safety and ventilatory outcomes. Hum Gene Ther. 2013 Jun. 24(6):630-40. [Medline]. [Full Text]. Spada M, Porta F, Vercelli L, Pagliardini V, Chiado-Piat L, Boffi P, et al. Screening for later-onset Pompe's disease in patients with paucisymptomatic hyperCKemia. Mol Genet Metab. 2013 Jun. 109(2):171-3. [Medline]. Spiridigliozzi GA, Heller JH, Kishnani PS. Cognitive and adaptive functioning of children with infantile Pompe disease treated with enzyme replacement therapy: long-term follow-up. Am J Med Genet C Semin Med Genet. 2012 Feb 15. 160C(1):22-9. [Medline]. Sun B, Zhang H, Franco LM, Brown T, Bird A, Schneider A. Correction of glycogen storage disease type II by an adeno-associated virus vector containing a muscle-specific promoter. Mol Ther. 2005 Jun. 11(6):889-98. [Medline]. Teener JW. Late-onset Pompe's disease. Semin Neurol. 2012 Nov. 32(5):506-11. [Medline]. Toscano A, Schoser B. Enzyme replacement therapy in late-onset Pompe disease: a systematic literature review. J Neurol. 2013 Apr. 260(4):951-9. [Medline]. van der Meijden JC, Gungor D, Kruijshaar ME, Muir AD, Broekgaarden HA, van der Ploeg AT. Ten years of the international Pompe survey: patient reported outcomes as a reliable tool for studying treated and untreated children and adults with non-classic Pompe disease. J Inherit Metab Dis. 2014 Aug 12. [Medline]. van der Ploeg AT, Clemens PR, Corzo D, Escolar DM, Florence J, Groeneveld GJ, et al. A randomized study of alglucosidase alfa in late-onset Pompe's disease. N Engl J Med. 2010 Apr 15. 362(15):1396-406. [Medline]. van El CG, Rigter T, Reuser AJ, van der Ploeg AT, Weinreich SS, Cornel MC. Newborn screening for pompe disease? a qualitative study exploring professional views. BMC Pediatr. 2014 Aug 14. 14:203. [Medline]. [Full Text]. Wang RY, Bodamer OA, Watson MS, Wilcox WR. Lysosomal storage diseases: diagnostic confirmation and management of presymptomatic individuals. Genet Med. 2011 May. 13(5):457-84. [Medline]. Wang Z, Okamoto P, Keutzer J. A new assay for fast, reliable CRIM status determination in infantile-onset Pompe disease. Mol Genet Metab. 2014 Feb. 111(2):92-100. [Medline]. Wens SC, Kuperus E, Mattace-Raso FU, Kruijshaar ME, Brusse E, van Montfort KC, et al. Increased aortic stiffness and blood pressure in non-classic Pompe disease. J Inherit Metab Dis. 2014 May. 37(3):391-7. [Medline]. [Full Text].